Marcus Rashford, under Ole Gunnar Solskjaer, has been a force to reckon with. Gone is the fresh academy graduate that was scrappy with his runs and hesitant in his tackles. The Englishman in the new era has been a goalscoring machine and poses numerous threats to defenders. Another change that the Norwegian gaffer has brought about is improving the team’s passing game, with one-touch football becoming common at Old Trafford. Chief in his tactics to implement solid passing is the rondo – a unit that has become a recurring sight at Manchester United’s training session. 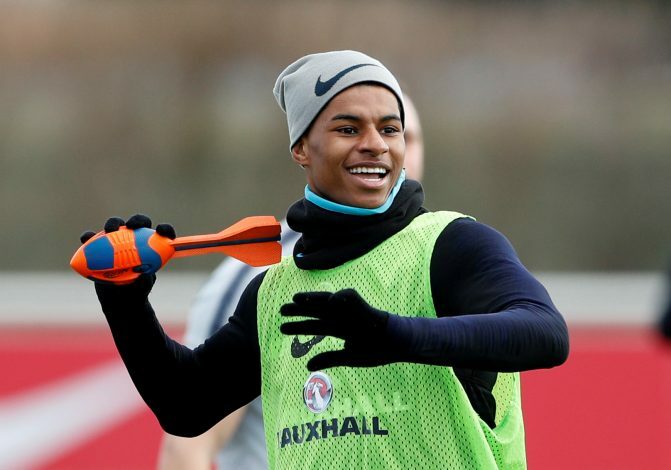 During their pre-match warm-up at the Emirates, Marcus Rashford may have had a little too much fun at a rondo. A video captures the United lads in training. Fred had just entered for his turn to capture possession and was being passed about. When the ball came to Rashford, the youngster opted to destroy Fred with a visually stunning nutmeg. The entire unit dispersed in disbelief about the incident and much banter was shared. Interestingly, Juan Mata, who went viral for his reaction to David De Gea’s heroics against Tottenham, was yet again the provider of a comical expression in response to Fred’s humiliation. Jokes aside, the growth of Rashford will have most Manchester United supporters beaming, as he seems en-route to aping the successful careers of Paul Scholes and Ryan Giggs. Such is the longevity of the lad’s tenure with the Mancunian outfit, that the very thought of him functioning for any club that isn’t United seems baffling. Under Solskjaer, he has netted five goals, and has been transformed into a technically adept player. In fact, the very notion that he is challenging Romelu Lukaku for the starting spot is testament to how good he is. His age will have numerous fans excited, as the potential he brims with could chart a successful future at Old Trafford.